It's hard to tell where vodka originates from. Some historians believe that the first vodka was produced in the territory of the present-day Poland in the 8th century or in the territory of the present-day Russia at the end of the 9th century. There is no exact information as to why National Vodka Day is celebrated on October 4, but vodka-lovers are fine with it. Actually, it can be any other day of the year, since they are all good to try a new flavor of vodka. 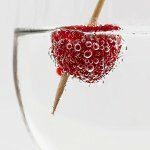 Originally vodka is flavorless that makes it a bit boring, but at the same time perfect for an impressive variety of cocktails. Enthusiasts can try to create their own vodka flavors, but if you aren't in the mood for messy experiments, just try crazy vodka flavors that already exist and can be bought in the USA. These flavors include smoked salmon, fluffed marshmallow, cucumber, cookie dough, peanut butter & jelly, orange cream, whipped cream, cotton candy, chocolate whipped, rose, chili pepper, bacon, root beer, espresso, cupcake and devil's food, and many others. There are more than 100 of them!